Arguably the father of all Italian wines, Falernum, reached mythical status at the peak of the Roman Empire. Drinking Falernum was a luxury and was certainly restricted to only the elite of the elite in ancient Rome. One particular vintage of this wine from 121 BC received high marks from Pliny the Elder, whose analysis I would trust over that of Robert Parker any day. According to the amazing book ‘Inventing Wine’ by Paul Lukacs, Pliny the Elder said of the 121 vintage “No other wine has a higher rank.” Take that Caymus!! What was Falernum you ask? It was made from a predecessor of Primitivo (as well as Falanghina) and grown along the coast in modern day Campania. The growing region is equidistant from Rome and Naples. This is still a hotbed for agriculture and is known as one of Italy’s most fertile areas. Somehow, however, the wines from this region have been all but forgotten since Roman times. Falernum was made from dried grapes, similar to Amarone in the Veneto now, and would have been cut with a little bit of water like all wine was back then. Sometimes this wine would age for decades before being consumed, yielding concentrated wines that may have seemed more like molasses by the time they were ready to drink. Wine was made this way back then because it needed to travel. This concentrated style ensured that the wine wouldn’t go bad. If it wasn’t for a few families like the Maddalena family of Regina Viarum, the production of these wines may have ended with the fall of ancient Rome. 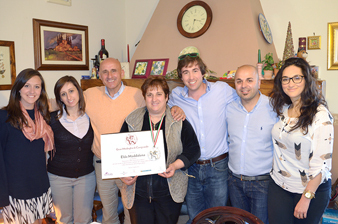 Elda and Pasquale are a husband and wife team that, along with their daughter Amalia, have carried on in the tradition of winemaking like many generations have done before them. 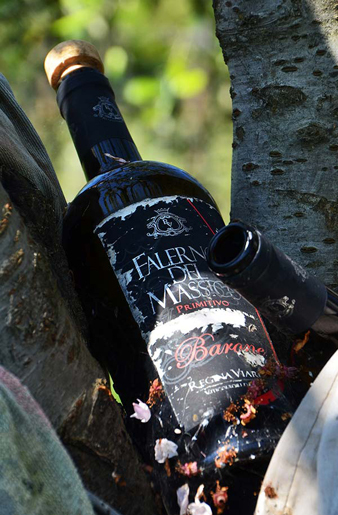 In fact, this family has produced wines on the Monte Massico, the heart of the ancient Falernum, for centuries. In fact, on the Monte Massico there are still remains from the Romans who started making wine at this site. A trip to this family farm is like stepping back in time. History is alive and well at Regina Viarum. How did the Falernum (Falerno in modern Italian) come to be? There was a poor farmer named Falernum who lived on the Monte Massico. One day he found a drunk, scruffy looking vagabond who needed a hand. Little did Falernum know, but this man was actually Bacchus, the god of wine, dressed as a commoner. This man was in need of food and water, but had nothing to offer in return. Despite that, Falernum offered all that he had, which was a few dried grapes and a meal. The two shared a few drinks together along with dinner, and Falernum, not able to handle his alcohol, soon fell asleep. The next morning Falernum awoke to discover vines as far as he could see planted in a suddenly very fertile soil. This of course was the work of Bacchus, who from that day blessed this land. Despite Primitivo being produced in nearby Puglia, it’s here in Campania where this wine was born, something that few people know. In Falerno, the style of Primitivo reminds me more of the great wines of Italy like Nebbiolo or Sangiovese. Not to say that there isn’t some great Primitivo in Puglia, but the quality of wine being produced by Regina Viarum is mind blowing. On these fertile soils, Regina Viarum produces natural wines coming from vines that are nearly 100 years old. This obviously builds character and adds complexity to these wines. Not only that, but Regina Viarum practices extremely low yields and is very selective in choosing the grapes that will produce their wines. Please do yourself a favor and seek out these wines! What is worth noting is that there are very few producers, 3 to be exact, who produce Primitivo within the Falerno D.O.C. Regina Viarum was also the first winery to convert to organic viticulture within this tiny, unknown D.O.C. 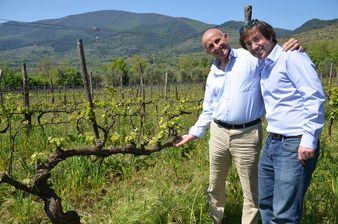 Regina Viarum has two total hectares of vine planted right at the base of the Monte Massico. The soil is a mix of some volcanic undertones with clay and sand. Vines are upwards of 100 years old, with an average age of 40/50 years. This vineyard has serious character with some very old vines, some of which are pre-phylloxera to be found. 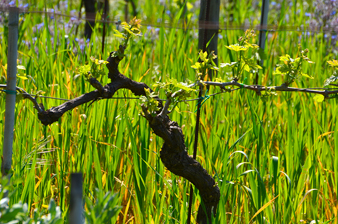 A natural ecosystem grows wild amongst the vines, helping to enrich the soil and create a unique ecosystem. There are 4,000/4500 plants per hectare with yields around 60 tons per hectare, and 50 tons per hectare of the Barone, the wineries riserva wine. A primitivo that reminds you of…Sangiovese? A little bit. This wine isn’t all “fruit bomb” and nothing else. There’s structure, minerality, elegance and earthy notes. There are barnyard notes as well. Don’t worry, there’s plenty of nice juicy cherries and darker fruits as well, but this ain’t no one note wonder. Grapes are manually harvested in the beginning of September. A longer maceration on the skins occurs before moving the wine to stainless steel where it will remain for 18 months, with a small portion of the wine aging in small French Oak barrels. This is certainly a bigger, bolder wine than the Zer05, with darker fruits and generally a ton more structure. Still, however, there is minerality and elegance that will really surprise you for a Primitivo. Tertiary notes of vanilla and cocoa are also present. This can hold its place on the table against any of the big wines of Italy. This is a big wine that needs a nice piece of meat or a hearty baked pasta. A cigar wouldn’t be a bad pairing either. Grapes are manually harvested in the beginning of September from vines of at least 75 years of age. The wine ages in French oak for at least 12 months followed by 6 months in the bottle before release.